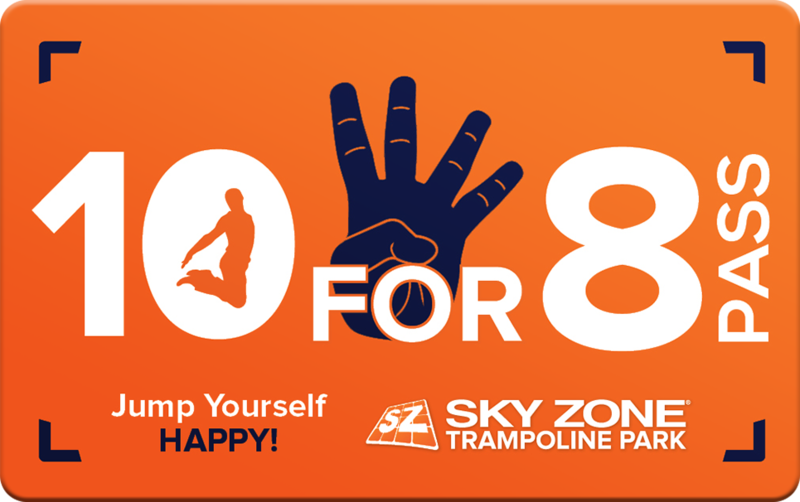 *Terms and Conditions: Can only be redeemed at Sky Zone Park. Restrictions may apply. Pass may not be redeemable same-day as purchased at select locations; check your local park for details. Pass can only be used for 60-minute jump sessions; cannot be used for birthday/group packages, fitness classes, merchandise, concessions or other programs. Each use will be counted as one 60-minute jump session, regardless of any special pricing. 60-minute jumps cannot be split between persons. Walk-ins are subject to availability. Lost, stolen or damaged cards will not be reissued. Passes may not be exchanged, resold or redeemed for cash; all sales are final. Cannot be combined with other offers. Offer may vary and is subject to change. SkySocks and taxes may not be included.